If you've picked up a Google Home Hub or a Lenovo Smart Display during your Black Friday shopping (US, UK), then you might well be using the smart devices as alarm clocks, in the bedroom, the kitchen, or anywhere else – and that just got a little easier. 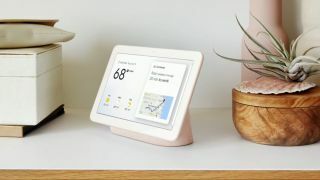 The latest software update rolling out to the two Google Assistant-powered smart displays lets you set alarms using the touchscreen as well as your voice. So, if you need to set an alarm for the morning late one night, you can do it without waking the whole household up as you bark a series of commands at your home gadget. There are other goodies in the update too, though the Google Home Hub one is only available for preview testers right now: media and alarm volume can be set separately, it's easier to save recipes for later use, and you can turn off the screen with your voice. A few interface tweaks should be noticeable as well, once you've got the software patch installed. Like smart speakers before them, smart displays are proving their longevity – as more updates arrive over time, your gadget will get more and more capable. Of course Google Assistant doesn't have everything its own way when it comes to the smart display space: the Echo Spot and especially the Echo Show are providing some stiff competition with the help of Amazon Alexa as the digital assistant behind the scenes. They're particularly appealing if you're already an Amazon Prime subscriber. Whether or not you want to use these Google and Lenovo smart displays as alarm clocks, this weekend might be a good time to pick one up. We've seen discounts on both devices in recent weeks, so head to our Black Friday hub (US, UK) for the latest offers.